The mind is the creator of the concepts you apply to making music. Carlos earned his B.A. in Music Education from Azusa Pacific University in 2018. He has studied with Robert Slack, David Washburn, Barbara Laronga, and is currently pursuing his M.M. in Trumpet Performance. 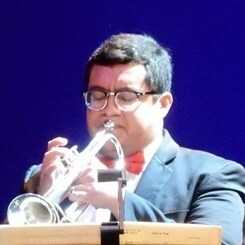 He has worked as a brass instructor at Gladstone High School, Garey High School, and the South Coast Youth Symphony Orchestra, and has performed at different venues including the Monterey NextGen Jazz Festival, the Walt Disney Concert Hall, the Renee and Henry Segerstrom Concert Hall. He has been teaching privately for 3 years, teaching both classical and jazz. Request Lessons with Carlos Peralta today!